In July 2011, expat, Teddy Sawka, developed an initiative called “Yarn Alive” under the branch of her NGO, Japan Alive. This initiative began out of the heart to bring tsunami-affected women of all ages together to learn how to crochet/knit and support one another during post tsunami recovery. Donors from around the world, as well as Japan, have given yarn, needles and hooks for these women to gather weekly in community centers at temporary housing units in Shichigahama. We discovered that giving people a project to do with their hands helped alleviate depression and anxiety. 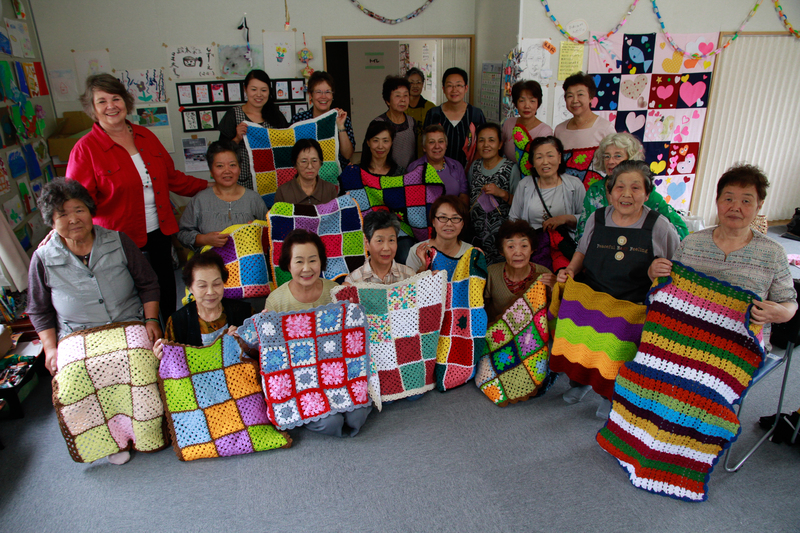 Yarn Alive’s first project was to make small blankets that were donated to a group in Kessenuma who had also suffered greatly during the earthquake and tsunami. We found that although these women were also victims, they found it a blessing to be able to help others. Not only has coming together helped counteract loneliness but it has also help unite women from different areas of Shichigahama who never knew each other before the tsunami. As a result, the concept of gathering together and being able to share their stories has brought much healing.